Good Morning, I must aplogise to my followers who have left me lovely comments recently, with one thing and another I've not managed to visit and comment on your postings lately, life just seems to get in the way at every turn these days, it's as much as I can do to get my DT cards made, let alone much else, I do promise to try and improve over the next few weeks as things settle down and my health is less of a problem. This week over at CD Sunday the theme is Exotic Birds and Blooms, So Joanna Sheens' Eastern Treasures CD to be the obvious lace to look for something suitable, and unusually I decided to go purple, the colours jumped out me, I know it's my fav colour, but I do try to avoid making purple creation as otherwise they would all end up being purple. Don't forget to pop over to my teamies blogs and see their creations. This is very pretty Wendy and I love purple too so a double yes from me. 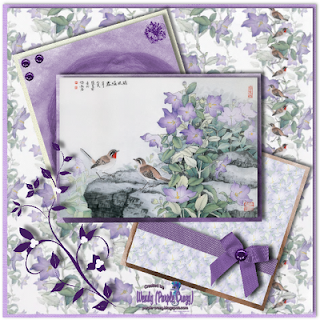 Gorgeous Wendy, I love the layout and of course purple. Hi Wendy this is stunning the image, colours and design are outstanding. Oh I love this, it's soooo pretty, thanks for joining us at Digi Doodle Shop Challenges. Fabulous card Wendy, great colours and LO, love the flourish. Nothing wrong with having everything purple in my book Wendy. This is a beautiful project. Love the image you have chosen and the design. Such a sweet card. Thanks for playing with Charisma this week. Loving the way you used your colors on this card. Life does sometimes get in the way, I can understand how you feel because it is happening to me too. Thank you so much for sharing your wonderful creation with us at 4 Crafty Chicks. Thank you for joining us in our Up Up and away challenge at 4 Crafty Chicks, great job! This is stunning so elegant & my fav colour too! !